I posted about my Crab Stuffed Baked Potatoes that I made for Christmas Eve dinner, and in that post I said the filling made more that you’ll need for the potatoes, so to bake it up and serve it as a dip. This filling is so good that it deserves a place of its own. 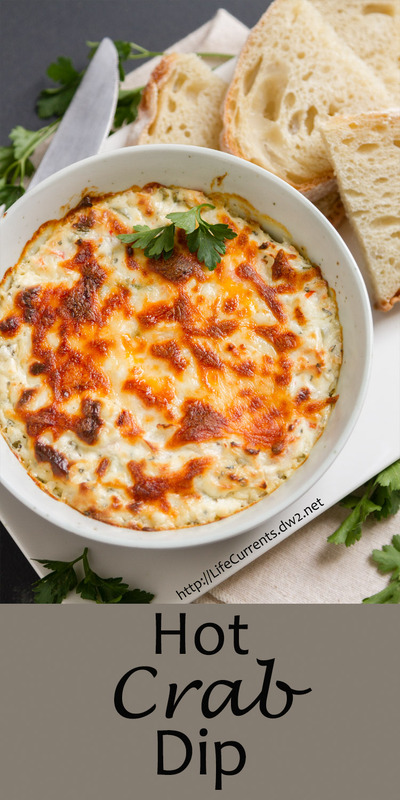 So, I bring you, Hot Crab Dip! This stuff is so good. We stood around eating it instead of making lunch, and it was gone lickety-split! I would totally make this for watching the game! It’s easy to make too. Simple to just mix all the ingredients together and pop in the oven. You can make it with real crab as well, but sometimes it’s nice to just have the option of not getting fresh crab. A friend of mine made it recently and she added sauteed mushrooms to it. It was great! Preheat oven to 350° F, and position oven rack in the middle. Combine cream cheese, sour cream, garlic, and Italian seasoning in a medium bowl. Taste and add salt and pepper if desired. Stir in crab meat, chopped green onion, and mozzarella cheese. Spoon dip into an oven proof dish, and sprinkle the top with a bit more shredded cheese. Bake for 20 minutes until bubbly and cheese has browned. Serve with chips, crackers, veggies, or slices of bread. Definitely need to give this a try! Maybe an appetizer for this weekend! Thanks for such an easy and flavorful recipe! This looks amaaaaaazing! Can’t wait to try this one this weekend! I would love to dig into this crap dip and I may even share with my husband! Looks delicious, Debi! I LOVE crab dip . Definitely going to give this a try.. SOOON. This is my kind of dip, to the point of I could make a meal from it! Oh gosh, warm crab dip is one of my true weaknesses! I can’t control myself around it, haha. Yours looks so rich and creamy! This dip looks amazing! How great this would be for game day or a get together!